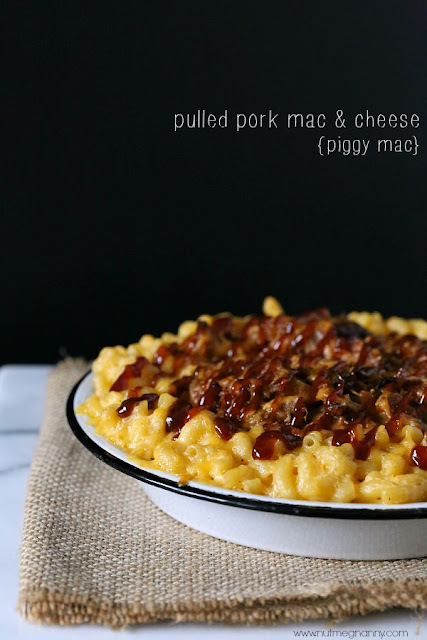 This pulled pork mac and cheese is packed full of sharp cheddar cheese and lots of slow is or instant pot pulled pork. For added flavor, I drizzled the top with even more BBQ sauce. Welcome to the first official mac and cheese recipe of Mac & Cheese Mania! I’m so pumped about this pulled pork mac and cheese. It’s crazy delicious and it’s the perfect mix of cheesy to meaty goodness. 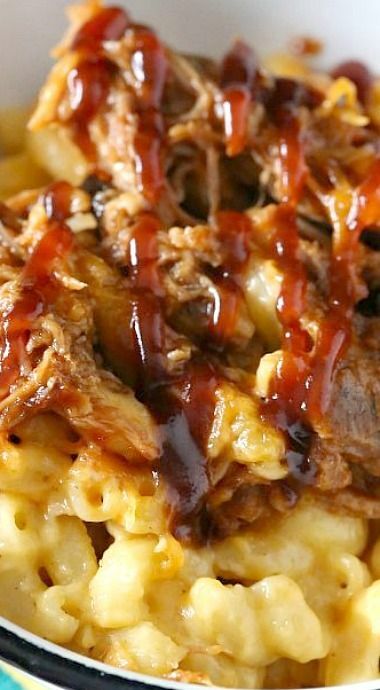 This pulled pork mac and cheese is packed full of sharp cheddar cheese and lots of slow cooker or instant pot pulled pork. For added flavor, I drizzled the top with even more BBQ sauce. In a 6 quart slow cooker add pork shoulder and yellow onion. Pour in ginger ale and cook on low for 5 hours. If you want to use your instant pot add your pork shoulder, yellow onion, and ginger ale to the Instant pot. Do manual time for 75 minutes and natural release. After it's been released follow the below directions. Once the pulled pork is tender and can easily be shredded with a fork it's ready. Pull the pork roast out of the slow cooker or instant pot, add to a large plate and shred with two forks. Pour out the juice from the slow cooker or Instant pot and add shredded pork back to the slow cooker or Instant pot. Add in 1 cup BBQ sauce and stir. Add more BBQ sauce if desired or needed. You want the meat to be coated but not dripping with sauce. Cover to keep warm while you prepare the mac and cheese. Preheat oven to 350 degrees and spray a 9x13 casserole dish with non-stick spray. Bring a large pot filled with salted water to a boil over high heat. Add in elbow macaroni and cook just until al dente following box directions. Drain pasta and set aside while you prepare the cheese sauce. Add a large skillet over medium heat and add butter. Once the butter is melted whisk in flour. Slowly whisk in milk until smooth. Reduce the heat to low and whisk slowly until the sauce becomes thick and creamy. Stir in the shredded cheese and stir until completely melted. Turn off the heat and stir in macaroni. Add macaroni and cheese to the prepared dish and top with pulled pork. Sprinkle on a little extra cheese if desired. You will have leftover pulled pork so don't be concerned if it does not all get used. Bake for about 15 minutes just to help warm the mixture through. Drizzle with extra BBQ sauce if desired. 0 Response to "Pulled Pork Mac and Cheese "